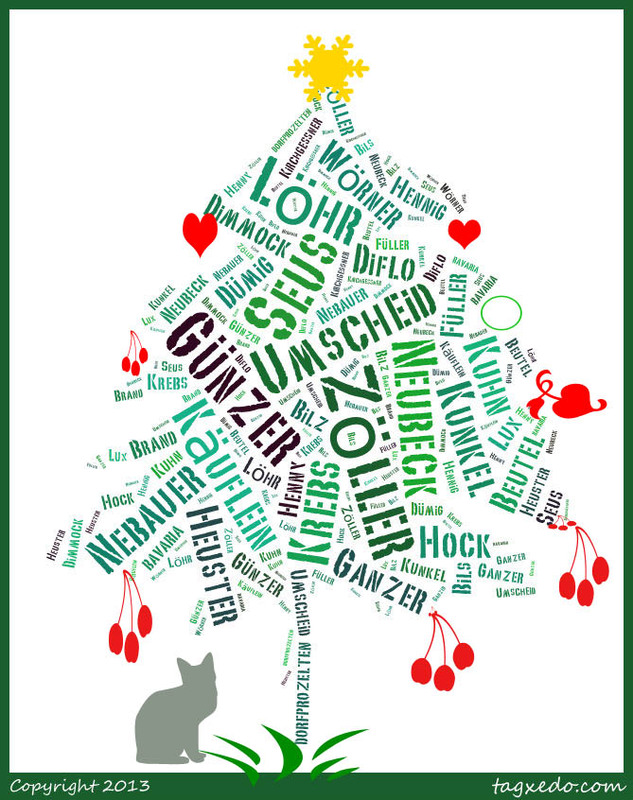 I thought it might be fun to do a Christmas tree with all the surnames of the Dorfprozelten emigrants to Australia. I’ve included the spouses’ names where they married a Dorfprozelten person who also emigrated. I didn’t include any spouses who were married in Australia but came from elsewhere. Where the surname is repeated in more than one family I’ve added a number. This doesn’t include all the children unless they travelled separately from parents, or were children of an earlier marriage. Hmm, I should have added another couple of Zöllers but I won’t go and redo it now. I used Tagxedo’s automatic shape options, and font selection. It makes for a quick image but you have no control over where the names occur or the size of the font for any particular name (at least as far as I’ve figured out). I’ve added the decorations using Photoshop and they do look a little dodgy but fun to try out. Image created using Tagxedo and Photoshop. Happy Christmas to all the fellow members of the Dorfprozelten Diaspora, wherever you live. Don’t forget if you have Dorfprozelten ancestors you can join us in the Facebook Dorfprozelten Diaspora group (just ask to join). I’m also curious whether any of the other Dorfprozelten descendants have Bavarian Christmas traditions which they’ve inherited down the generations. If you have, why not tell us all about them by commenting on this post. This entry was posted in Bavarian family history, Dorfprozelten and tagged Christmas, Diaspora, Dorfprozelten surnames by cassmob. Bookmark the permalink. Thank you for the effort you put into the “Dorfprozelten Christmas Tree” we enjoyed it. Merry Christmas to all Dorfprozelten descendants and families. Thanks Kevin and Phyllis, I do enjoy these little diversions so I’m pleased you liked it too. Happy christmas to you and yours.